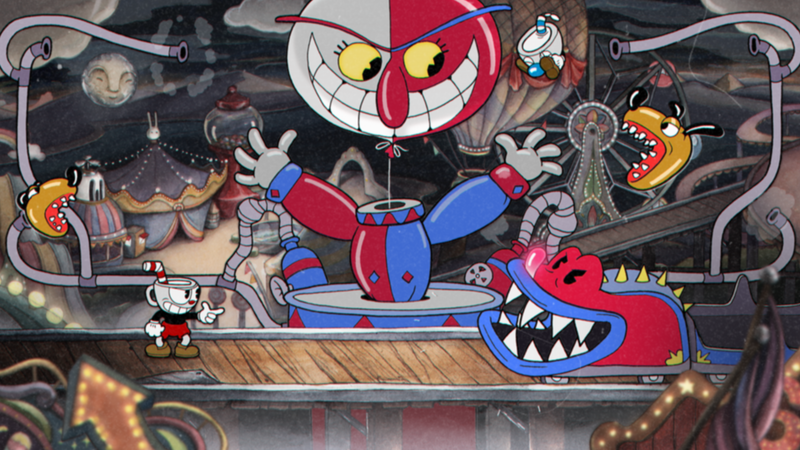 Cuphead is the most addicting, fun, challenging, visually creative game you will play this year designed by an independent game studio, StudioMDHR (Studio Moldenhauer) founded by two brothers, Chad and Jared Moldenhauer. The game design is influenced by the golden age of cartoons with hand drawn animation, painted backgrounds, barbershop quartet and jazz style music which creates a pleasant break from today’s over the top games. We found ourselves losing track of time as we played the game because we had a lot of fun. The game only has local co-op at this time which didn’t bother us at all. Although we couldn’t play together online, we were in a party chat working through the game, fighting the same bosses and giving each other tips on how to beat them, while slightly bragging who we beat. Our two doomed heroes, Cuphead and Mugman, found themselves wondering around Inkwell Isle at the door of the Devil’s casino. They made a bad deal gambling their souls away but the Devil decided to put them to work collecting the souls of others he had contracts on. As soon as our heroes are kicked out, you seek advice where you have a chance to play through a quick tutorial that teaches you how to play the game. Once you exit you are walking around a beautifully designed mini-map that will lead you to different boss fights, run ‘n’ gun levels, hidden secrets (yes one of these secrets is an achievement called cutting corners) and a small little wagon shop where you can buy upgrades or charms. The mini-map may be small but it is filled with exciting illustrations, secret shortcuts and mini-quests to help travelers a long your way. Each area of the map is different as well, such as the first area being designed around a forest, and the second area around a theme park, there is another area but we haven’t gotten there yet. It personally reminds me of the mini-map from Super Mario Brothers on the SNES. The run ‘n’ gun levels you find around the mini-map are fun and difficult. There are no health pickups, no check points and no quick shortcuts. It takes perfect timing to collect the coins (usable in the shop for upgrades), perfect angles to kill the enemies and patience to destroy the mini bosses at the end of these levels. These levels are designed to make you think on how to approach different each section because these levels do change. It isn’t just a quick run through while destroying everything in your path. At some point in the levels you will have to dodge, while jumping over obstacles. In the level pictured above you can use the magic cards to flip yourself upside down while continuing to get to the end of the level. Some enemies will appear out of thin air, and in one of these levels you will find a friendly trampoline that helps you jump over objects while avoiding exploding balloons. The boss battles open in a friendly way, in a sense calming you down and preparing you for the challenge ahead. No matter how frustrated we became during a battle it was always fun and interesting to see the different phases of each boss during the fight while trying to come up with our own tactics on how to beat them. Every single boss fight is creative in it’s own unique way. Don’t fear dying, because you instantly start right back at the boss to try again. You even receive a whimsical note from the boss on your death. At this point you can choose to exit to the mini-map, quit the game, and the pause menu even has a retry option in case you need to start the fight over. These battles take perfect timing to dodge their attacks, moments to parry perfectly, and decisive decisions on which weapon and charms give you the best advantage to beat the boss. If you find the regular mode on boss fights too difficult you can choose to try simple mode to learn the boss patterns although you won’t be able to collect the contracts on the bosses. 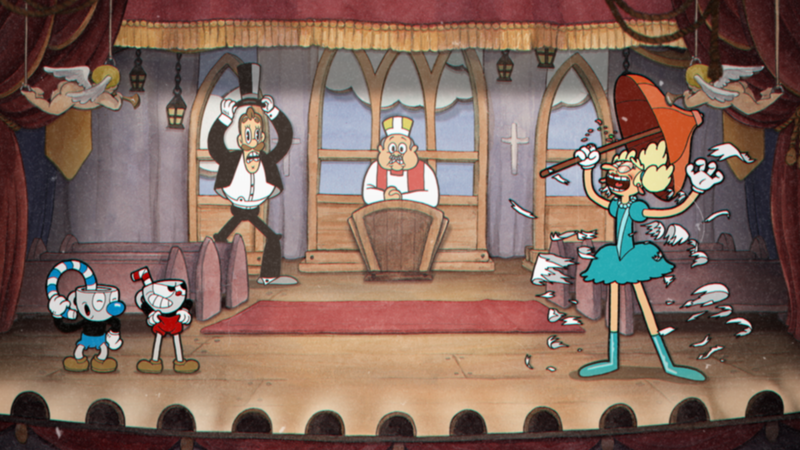 Cuphead is candy on the eyes and I can’t wait to jump right back in. It is the most fun, addictive, whimsical game I have played this year and we hope you get to enjoy it as well. There is no other game out there that is exactly like Cuphead even though Cuphead feels like it is influenced by Contra like shooting, Mega-Man difficulty and the 1930s cartoon era. It sets a new standard for 2D platform shooters. Hats off and congratulations to StudioMDHR for one of the best games I have ever played. At a $19.99 USD price point it is a game you shouldn’t miss. 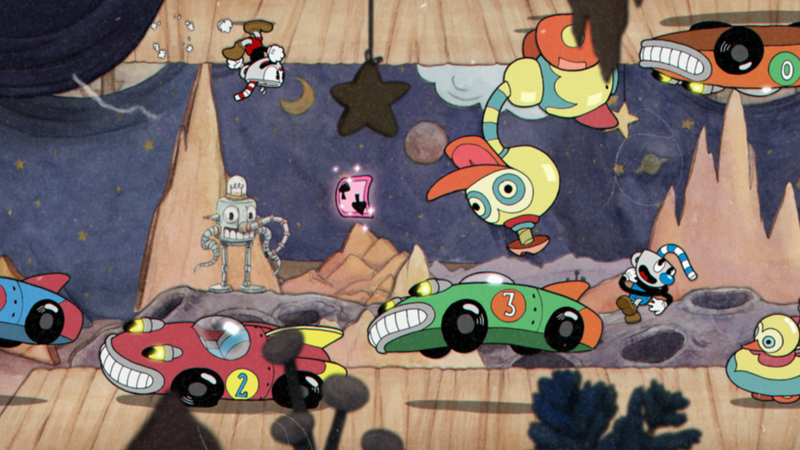 Cuphead is the most addictive, fun, challenging and whimsical game that we have played this year. Previous article4GwQPodcast Ep 149 – Red Dead 2, SW Battlefront II and more! Awesome review! I have seen so many good things about Cuphead I couldn’t resist buying it.